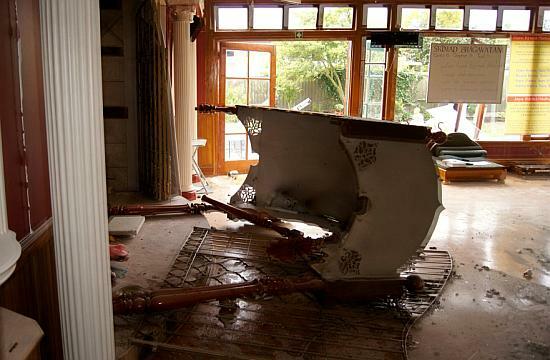 ISKCON Devotees in Christchurch, New Zealand are still in shock after a 6.3 magnitude earthquake struck on February 22nd, destroying their temple building and shattering the Deities of Nitai-Gaurachandra beyond repair. Incredibly, no one was seriously injured. The disaster comes on the heels of a 7.1 magnitude quake in the same city on September 4th last year, which caused flooding and structural damage to the temple, but left the Deities safe. 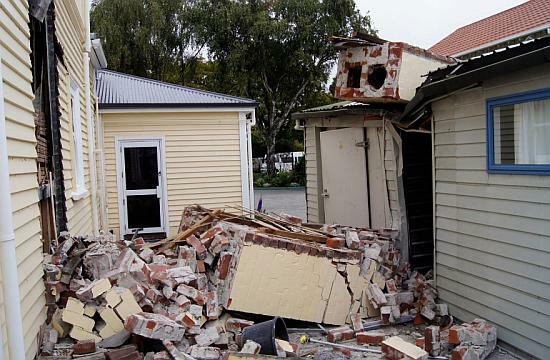 Three thousand continual aftershocks since then, including a powerful one the day after Christmas, weakened structures further and left Christchurch residents tense. 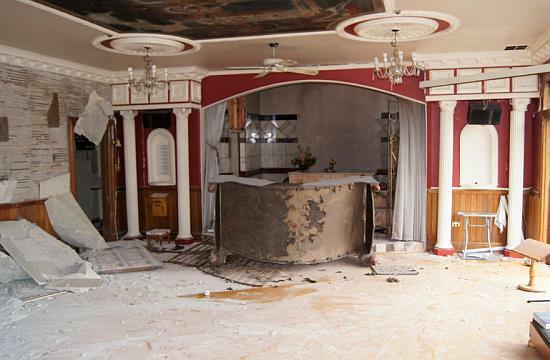 Tuesday’s earthquake, although smaller in magnitude, caused far more damage than September’s one, as it hit significantly closer to the main population center of Christchurch, and was at a more shallow depth. Seventy-five people are now dead and 300 missing, with officials saying that the death toll will almost surely climb further. 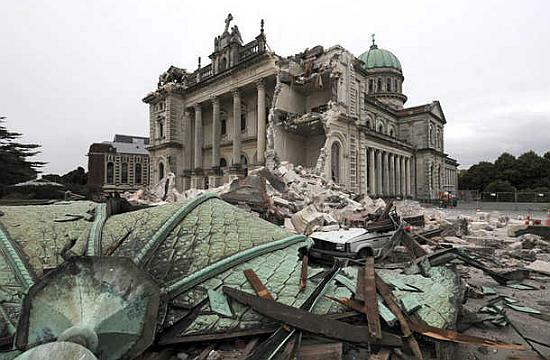 The spire of the city’s stone cathedral toppled into a central square, multistory buildings collapsed, sidewalks and roads cracked, and people were buried in rubble, some crushed to death. Then, at about 12:53pm, there was a slight tremor. This wasn’t cause for major concern in itself, since devotees had been used to aftershocks since September. But two seconds later, the tremors became extremely intense, shaking the three-foot marble Deities back and forth violently. Without thinking, Sevananda dropped his bell and chamara, ran forward, and seized Lord Nityananda and Lord Chaitanya around the waist, one in each arm, trying to keep them steady. But the tremors were so strong that all three were shaken forward nearly a foot. Then, suddenly, Sri Sri Nitai-Gaurachandra were hurled right off the altar, taking Sevananda, who was still holding them protectively, with them. The wooden altar, which crashed to the floor, just missing Sevananda Dasa. Sevananda sustained a big gash on his arm, bruising on his shoulders, and scrapes on his legs and arms from sharp pieces of marble or metal. With a hospital two-minutes walk from the temple, he has received treatment, and although he’s still feeling sore, he’s doing well. The two-storey temple, located in the city, however, is beyond repair. Already weakened from last September’s earthquake, whole walls have collapsed, windows and glass doors have blown out, staircases have been destroyed, and large cracks have appeared throughout the structure. There are piles of rubble everywhere, the conservatory is flattened in a mess of shattered glass, and a chimney on the side of the temple was dislodged and crashed into the house next door, embedding itself in its roof. The temple's glass conservatory smashed to pieces. 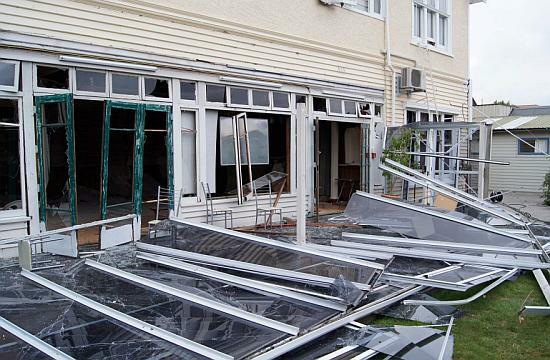 According to Auckland temple president Kalasamvara Dasa, both the Christchurch "temple house" -- used for accommodation -- and another house next door have been rattled "off their foundations" and are likely to have to be razed to the ground due to unsafety. Devotees’ houses nearby have also sustained severe structural damage, chimneys have fallen through roofs, and possessions—bookcases, cooking utensils and appliances, computers—are scattered everywhere. Sevananda says that devotees whose houses have not been damaged have extended a hand to those who were affected, inviting them to sleep in their lounges or on their living room floors. Landlines are overloaded and don’t work properly, and power has been cut off in parts of the city, leaving cell phones the only means to contact devotees in Christchurch. Meanwhile, the government is providing help in every way they can. While devotees were in complete shock on the day of the earthquake, the mood is more one of practicality now. 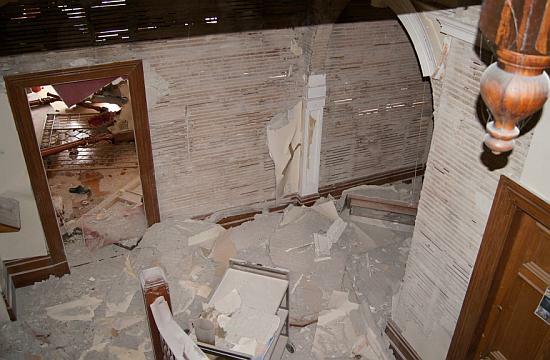 A chimney dislodged from the temple and crashed into a neighboring building. Devotees in other parts of the country are extending their invitations to provide shelter for the Christchurch devotees, and are doing their best to arrange flights for them out of the stricken city, but it isn’t easy. 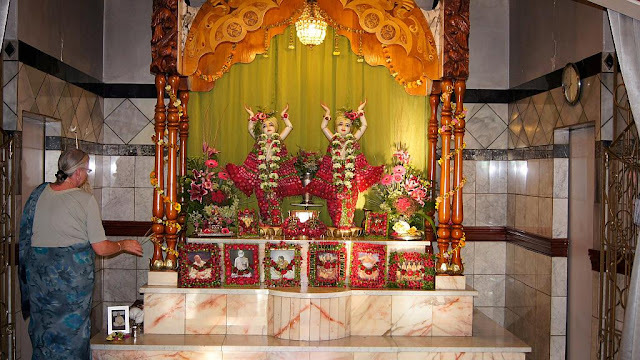 The best thing devotees around the world can do now for their Christchurch brothers and sisters, Sevananda feels, is offer their well-wishes, thoughts and prayers for their safety and well-being. Sri-Sri Nitai-Gaurachandra, who protected their devotees but were themselves shattered in the earthquake. 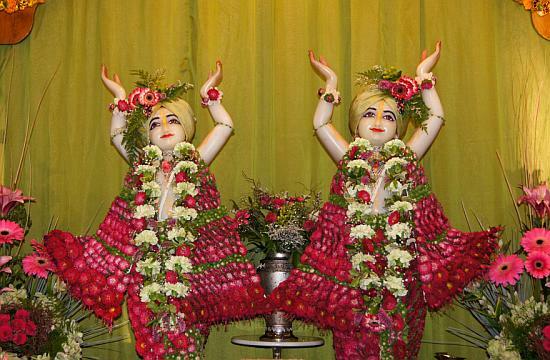 Sri Krishna Chaitanya temple of Auckland, with support of Indian Association in Christchurch will serve free, freshly cooked vegetarian meals to the earthquake victims in Christchurch. The team aims to provide around 250 – 500 meals every day for 5 days starting Monday 28th February. Those who wish to donate goods including non-perishable food items and are able to provide transport and manpower for collection, please URGENTLY contact Yogesh Punja on 021 786 520. The Hindu Organisations, Temples and Associations (HOTA) Forum, in coordination with Sewa International, have launched an appeal to contribute to the ongoing aid and relief work in Christchurch, and to residents who have been displaced to various New Zealand cities. To assist with Sewa International relief work, contact nz_hota@yahoo.com or Kishor Mistry on 09 537 2766. You can make monetary donations to Sewa International through the ASB account number: 12-3055-0216216-00.